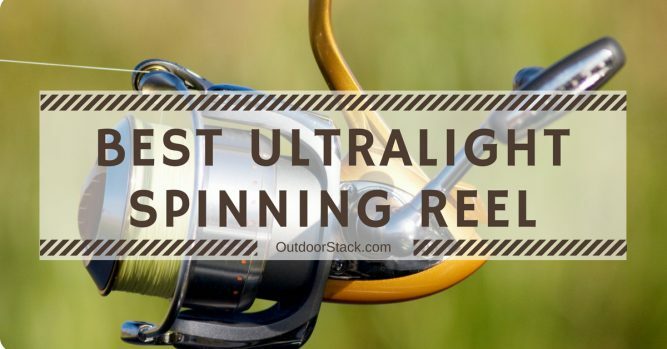 Best Ultralight Spinning Reel: We have reviewed some of the top-rated lightweight fishing reels on the market to help you buy Best Ultralight Spinning Reel. Okuma Ceymar is the Best Ultralight Spinning Reel as per our reviews. Okuma Ceymar Spinning Reel is an ultralight yet heavy-duty fishing reel. It offers multi-disc support and a felt drag system with a pressure of 5 lbs. Okuma has crafted the Ceymar spinning reel using precision machined 2-tone anodized aluminum. It comes with quick-set anti-reverse roller bearings to provide stability even under extreme conditions. Okuma Ceymar weighs approximately 8 oz. and comes equipped with a maximum drag pressure of 5 lbs. It features an 8-bearing drive system with precise elliptical gearing. These features give you ultimate control and handling. This ultralight Okuma reel comes with a gear ratio of 5.0:1 and bearings rated at 6BB + 1RB. It has a line retrieve of 21 in. which gives you much leeway. It has a line capacity of 2/210, 4/110 or 6/70 which gives you flexibility for choosing the right fishing approach. Inside of the box, you will receive the Okuma Ceymar lightweight spinning reel wrapped inside of the protective packaging. The packaging is very neat and organized which provides a sense of confidence in the product. You will also get a set of in-depth instructions and a warranty manual. Okuma Ceymar uses a multi-disc oiled felt drag system with a quick-set anti-locking roller bearing. It has a max line capacity of 2/210, 4/110 or 6/70 diameter in mm. Okuma has designed this reel using machined aluminum with a 2-tone wobble-resistant anodized spool. The Okuma Ceymar spinning reel has a maximum drag pressure of 5 lbs., which is more than enough power for an ultralight spinning reel. This reel has a machine cut brass pinion gear that secures your catch with precision. The multi-disc oiled felt drag system on this reel gives you a cutting-edge control over your catch. These features in combination with the 2-tone machined aluminum spool give you ultimate control over the reel. The handle on thie C-65 reel is based on an ergonomic design for ultimate comfort. Okuma Ceymar has a corrosion-resistant body architecture to protect your reel from degradation. The sheer power of the Ceymar reel is insane. The reel has a built-in 8-bearing drive system that gives you ultimate flexibility. The complete design of this reel focuses on providing precision and stability. The solid aluminum ball wire provides a high point of control for you to manipulate at your will. The Okuma Ceymar reel comes with an ergonomic grip that provides great comfort. This reel also has a narrow blade design which makes it very versatile in its movements. Okuma Ceymar also features a black anodized forged handle to provide a tight grip you can feel throughout the reel. This ultralight reel has a quick-set anti-reverse bearing system that helps to stop slippage. It also has a RESII system that uses a computer to balance the rotor mechanism. Lightweight EVA material is used for making handle knobs. This gives your wrists and forearms significant relief. Okuma has used long-lasting materials for designing this ultralight spinning reel. Most of the reel is made with high-quality anodized components. Use of such high-quality material in the manufacturing process makes Ceymar resistant to damage. The corrosion resistant graphite body of this reel is a feature worth its weight in gold. The design will give you confidence that this reel will measure up even in extreme circumstances. The Okuma Ceymar Reel has a precision machine-cut brass pinion gear that gives you a solid contact point. The reel also has a very solid aluminum ball wire and machined 2-tone anodized aluminum spool to give you a solid feel all around. This Okuma lightweight fishing reel also comes with a RESII computer balanced rotor equalizing system. It gives you a solid contact with your spool so that you do not have to worry about losing your line. This reel has a max line retrieve of 55.4 cm. with a gear ratio of 5.0:1. The bearings are rated 6BB+1RB and the reel weights 170g which is the perfect combination for usability and durability. The Okuma Ceymar ultralight fishing reel has a max drag of 3 kg which allows you to reel in your catch gently yet powerfully. The Cyclonic Flow Rotor gives this reel robust versatility that allows to you to adapt to any environment. Okuma Ceymar also has a line control system that allows for premium line-lay. In addition to these features, this Okuma reel also comes with a multi-disc oiled felt drag system that delivers precision on a consistent basis. The Okuma Ceymar reel has an astonishing design and streamlined aesthetic quality. The handle is designed using forged zinc that is rigid in combination with a black anodized handle design. The handles are easy to use as they are made from lightweight EVA material that is durable yet easy to use. The spool on this Okuma lightweight spinning reel is made from machined 2-tone anodized aluminum. The body is composed of corrosion-resistant graphite. Okuma Ceymar comes with a standard 1-year manufacturer warranty. For more information visit the manufacturer’s website. Okuma Ceymar is the perfect ultralight fishing reel for fishing enthusiasts. The combination of strong and durable materials on top of a streamlined design makes it a very powerful reel. The corrosion-resistant graphite body gives confidence that the reel will serve well in all conditions. You will also greatly appreciate the quick-set anti-reverse bearing made from machine-cut brass. The handle on this reel is super lightweight and tough while still feeling comfortable in your hand. All these features combine in the multi-disc felt drag system that makes this reel a superior lightweight reel option. Okuma Ceymar lightweight spinning reel is the best ultralight spinning reel for fishing as per our reviews. We hope you like our pick of the best ultralight spinning reel. If you have any other suggestion, you may let us know via comments. OutdoorStack.com is a participant in the Amazon Services LLC Associates Program, an affiliate advertising program designed to provide a means for us to earn fees by linking to Amazon.com and affiliated sites. All the information on this website is published in good faith and for general information purpose only. OutdoorStack.com does not make any warranties about the completeness, reliability and accuracy of this information.